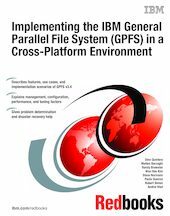 This IBM® Redbooks® publication provides a documented deployment model for IBM GPFS™ in a cross-platform environment with IBM Power Systems™, Linux, and Windows servers. With IBM GPFS, customers can have a planned foundation for file systems management for cross-platform access solutions. This book examines the functional, integration, simplification, and usability changes with GPFS v3.4. It can help the technical teams provide file system management solutions and technical support with GPFS, based on Power Systems virtualized environments for cross-platform file systems management. The book provides answers to your complex file systems management requirements, helps you maximize file system availability, and provides expert-level documentation to transfer the how-to skills to the worldwide support teams. The audience for this book is the technical professional (IT consultants, technical support staff, IT architects, and IT specialists) who is responsible for providing file system management solutions and support for cross-platform environments that are based primarily on Power Systems.